Why do you need benchmarking? Why does your brand need to be cognizant of social media benchmarks? What things can be benchmarked on social media? Is it only quantitative? Do smaller brands need to benchmark themselves on social media? How frequently should you benchmark yourself? How long should you spend on social media benchmarking? What if you are not doing as well as your competitors? How do you produce reports for benchmarking? How to make your boss/client care about benchmarking? What to look for in a social media benchmarking tool? Social media benchmarking is key to prove that you are performing better than the competition. However, if your real challenge lies in finding, recognizing and reporting these benchmarks, this article is for you. Beginning with a basic explanation of what are social media benchmarks to how to report ROI through benchmarking, we’ve covered them all. Read on to find out how to outperform competition with social benchmarking. In the most technical sense, benchmarking is the process of comparing one’s processes and performance metrics to industry bests or best practices from other companies. It’s what drives goals in any field – from management to sports. It answers the question – ‘Is what we’re doing good enough?’. That’s because a stand-alone performance is subjective while a comparative study is empirical. Benchmarking is essential to contextually recognize the performance of any efforts. In simple terms, to understand how well you are doing, it is important to compare with peers. You might have received more interactions on a piece of content than normal or more views than ever before on a video you uploaded to YouTube. Before you go ahead and give yourself that proverbial pat on the back, you need to take a step back and ask yourself, “is that good?”. By your own standards it might be good (this is internal benchmarking) but by throwing the net out to cover your direct competitors or even the wider industry, you get a better picture of what ‘good’ is and where you fit on that scale. Without benchmarking, it is impossible to understand where you stand in the market. Top level management isn’t simply interested in knowing how your end of season sale performed, they want to know how it did in comparison to “other” brands. If you made more money than the previous year that is obviously good, but if your competitors were able to increase their sales by an even larger percentage it puts your efforts in perspective. Whether it is for reporting or internal assessment, benchmarks are essential to justify any analysis. A social media benchmark is a single metric that averages the performance of all brands in an industry. It acts as a yardstick to gauge your own performance. The top line performance of a brand’s social media efforts can be measured through a social network’s inbuilt analytics. However, brands and agencies do not have ready access to competitor’s data. Without spending days of effort, there is no way of even approximating how a competitive brand is performing on social media. To start off, brands need a tool, or a suite of tools, to comprehensively analyze their own performance. Though social networks have started strengthening their analytical capabilities, there are still plenty of limitations with overly simplistic numbers. Key metrics to be considering for benchmarking include share of voice, mentions, sentiment, campaign performance and factors such as demographics, and influencers to personalize content and get a pulse of your market. Only the more advanced analytical suites can offer these benchmarks. Once brands have a thorough understanding of their own social media efforts, it’s time to bring competitive intelligence into the picture. Benchmarking social media efforts could get as granular as pitting a specific metric against one particular brand or as broad as comparing overall performance through an industry-wide average. From the chart above you see that Carnival Cruise Line is engaging better than the average hospitality brand in North America. However, in summer related conversation, Royal Caribbean International is engaging better than Carnival Cruise Line. If “summer” is a topic the brand is trying to perform better on, they will be able to go in and see the posts of Royal Caribbean and dissect to understand why they are performing better. Like you’ve seen in the examples above, social media benchmarks can be customized according to geography, industry, brand or even to the a topic level detail. Like in any business, keeping an eye on competition and constantly measuring to see how you compare with them is one of the key contributing factors to improving one’s own performance. Without benchmarking, it is impossible to understand where you stand in the market. The social space is cluttered thanks to brands focusing on a variety of efforts. While six months of planning went into 3 posters, 3 radio and one TV ad with a central theme during the mass-media days, social media is the age when community managers are expected to be creating and publishing microcontent more than three times a day. While the goals of mass media campaigns were mostly a broad mandate to increase sales or spread awareness, social media campaign goals can be more targeted and specific. The goal of a campaign could be to grow community size, to increase app downloads, to get more people talking about the brand through mentions, solving customer pain points, showing product usage or even simply positioning the company through a standard content type or voice. As the goals have become more specific, measuring has also become that much defined. Social media benchmarking helps you understand how your content strategy is resonating with your audience, and if it is not, benchmarking can direct you to areas where there is room for improvement. For example, on Instagram, Nike seems to be growing their follower base at a rate slightly higher than the industry average. Though that seems to be impressive, other brands such as Adidas Football are a growing at a rate higher than them. This could be a cause for concern. 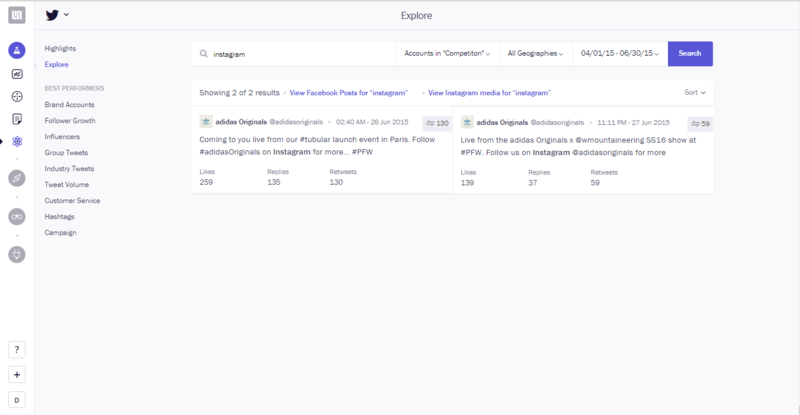 By doing a simple search on Research section in the Unmetric app, it was found that Adidas had a few tweets that redirected their Twitter followers to their Instagram account. This could be one of the factors that led to their growth. This way, benchmarking could lead a brand to unravel competitors’ strategy through which they can fuel their own efforts. For most brands, Facebook was the first social network where social media marketing was attempted. This could mean that most social media marketing professionals are familiar with the site, and the available analytics and benchmarks to be measured. However, the nature of digital age means that there are constant changes to metrics available, key metrics to benchmark, and actionable insights to inform content strategy. 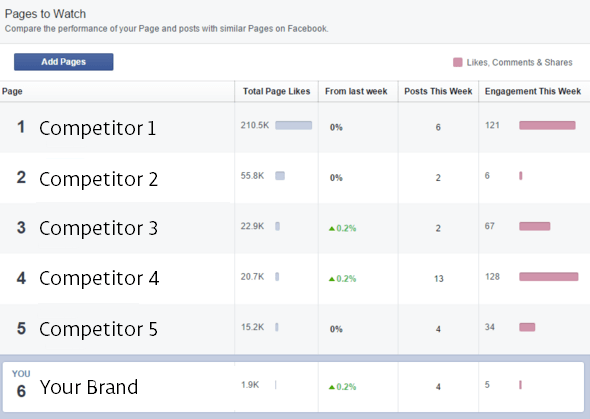 Facebook Insights actually offers a basic level of benchmarking in the overview tab. You can add competing brands (or even brands that you might admire) and you can compare your basic stats like fan numbers, number of posts and interactions over the past week. Side note: If they are getting more interactions than you, then it would serve you well to go and do a bit more digging and find out exactly what content is doing so well for them. Head over to the Posts section and select Top Posts from Pages You Watch. This will show you the top posts from those pages from the past week. It’s not much but it’s better than nothing. As a snapshot, this is a pretty good way to understand how you’re doing vis-a-vis the competition. It’ll tell you at a glance whether you need to be posting more or if your competitors are getting more interactions on their content. Facebook insights also gives you the ability to benchmark your performance against yourself for a specified period. For each chart on the Likes, Reach, Page Views etc. charts, there is the option to benchmark various metrics like the Paid or Organic reach. While these benchmarks are useful for your own analysis, they don’t give much information in a wider context. Your boss or your client will naturally want to see a consistent improvement in your own performance but many are likely to ask: is it good enough? While social media as a whole serves multiple purposes – content and campaign level marketing, increasing brand awareness, educating on brand message, customer relationship management, community building, lead generation, etc. – giving each social network a primary objective helps build the relationship with your audience more efficiently. Twitter lends itself quite naturally to CRM, so keep that in mind when choosing which metrics you’re going to benchmark for the platform. Twitter Analytics itself offers a range of metrics that you can benchmark. By default, when you first see the dashboard, you’ll find a vertical scroll of your performance on Twitter benchmarked on a monthly basis. From the number of Tweets, to impression, profile views and even Tweets linking to you and your content, it’s a pretty efficient format of analytics that gives you a sense of how your performance on Twitter has evolved. The dashboard also highlights your best engaging Tweet and best performing Mention, to help you understand which parts of your content strategy are particularly working best for you. Twitter Analytics also provides advanced insights, but that topic will be discussed in social media intelligence, as they are not easy to benchmark. While this can give you a general sense of your content strategy, it doesn’t shine a light on how you’re doing compared to other brands in the sector. Gaining 300 new Followers sounds like a great number until you realize that your competitor gained 1200 in the same time period. That’s when competitive benchmarking can really help you understand not just what ‘works’ for your competitors but also provide tangible insights into your audience as well. The very nature of benchmarking makes it quantitative but don’t think that doesn’t mean you can measure quality from the numbers. 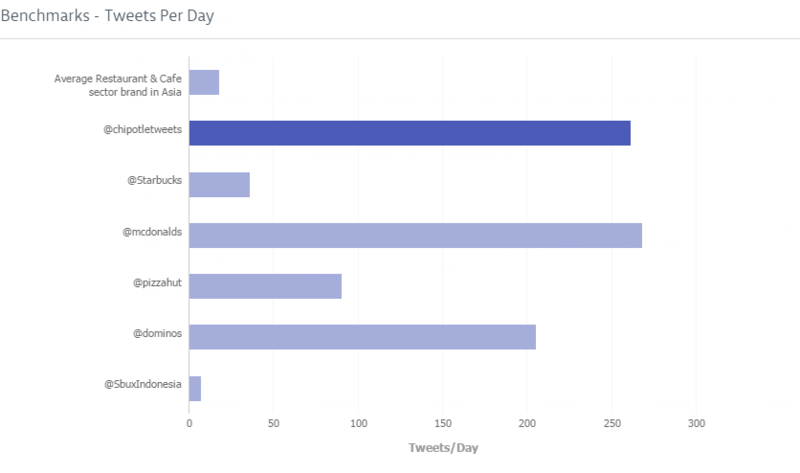 I benchmarked Chipotle’s tweet frequency to estimate the quality of its content. 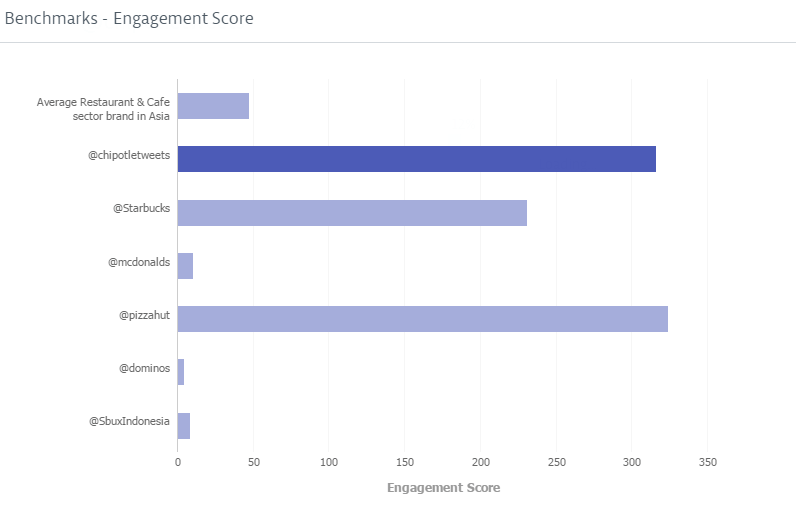 I then benchmarked engagement to give the number some context. We can see that Chipotle is way above the industry and sets the benchmark high for other QSR brands. We can also see that in spite of tweeting more McDonald’s hasn’t been able to achieve the same results while Starbucks by posting much less has been able to engage a lot better than the industry. By looking at multiple benchmarks, we’re able to elevate the qualitative value of the metric to a quantitative level. However, keep in mind that content strategy can be understood at a greater depth with metrics like ‘Content Type’ and, ‘Paid post detection’ can help you identify if the content is simply being sponsored. Benchmarks are pretty simple to read, right? You see the number your brand has and all you need to see if that’s bigger than the industry average and competition. In most cases, reading a benchmark is that simple, but in a few other cases, especially in social media, benchmarks need to be dissected further. Say your brand’s engagement score is higher than that of the industry average, that’s a good sign that your content is being appreciated a lot more than those of other brands by your audience. Here we can see that Airbnb only has a short distance to go to perform as good as the average brand in the hospitality sector. However, looking at the scores of a few other top hospitality brands with similar fan bases, we can see that Airbnb could be performing a lot better. Small businesses often have enough on their plate without having social media to think about as well. In Unmetric’s early incarnation as Eyes and Feet, we provided social media data to small businesses like spas, bars and restaurants only to discover that these small business owners had no time to analyze and take action upon the social media data we provided. That insight was the catalyst to create what is now Unmetric. If a small business has never done a social media audit to benchmark their performance before, there’s never a better time than now to do it. The audit across social networks will give the brand an idea of where they stay now versus the competition and may dictate a change in strategy. For example, it could be that spending time publishing content on Facebook is not as beneficial as publishing content on Instagram or perhaps the performance on Twitter is far below what the competition achieves. This is going to be one of those ‘it depends’ answers unfortunately as there’s no hard and fast rule. For small businesses and businesses that don’t have a dedicated social media person or team or don’t have social as a focus point for its marketing activities, a one-time audit should give you a broad view of the landscape you are competing in so that you understand where you stand. For businesses that do rely on social media as a means to generate visibility, sales and provide customer support, social media benchmarking should be a regular activity. If not every month then it should be done a minimum of once a quarter. Ad-hoc benchmarking should be done whenever a new campaign launches and ends to see the impact it has ended. If the social media is outsourced to an agency, then doing a full audit to benchmark current standings is absolutely essential so that the performance of the agency can be properly measured. The most crucial factor in the amount of time you spend is going to be down to the tools that you use. With all these factors taken into account, it could take up to four hours to gather and analyze the data. What if you are not doing as well as your competitors? Do you need to be ahead in every metric? Before you measure performance, it’s important to know what you’re measuring. This is why goal setting is key for any campaign. It’s easier to measure when you have a singular goal – like increase in fan numbers or increase in engagement. However, knowing the vague briefs analysts have been getting, we know your company wants to stay ahead in every single metric. Here is what you do to measure this. For starters, try and educate your team as to why a singular goal per campaign is essential to make ROI measurable. If you succeed, you’ll be able to track the metrics important to you and find ways to out-perform competition. If not, remember to benchmark the same metric on different levels. With benchmarking, it’s more important to stay consistent than stay ahead. Keep in mind that benchmarking can be done against an industry, a specific brand or even both. While benchmarks can be represented as numbers, looking at them as a chart makes it easier to read. With Unmetric’s platform, reporting is automated. At the click of a button, you can create and download PPT and Excel reports that can be customized. Simple! Show them the connection between benchmarking and ROI. Constantly comparing your performance with peers and tweaking your strategy to improve is sure to bring your brand to the top of your customers’ mind. The best way to plug competitive intelligence and benchmarks into strategy is to involve your creative or content team. You can interpret the benchmarks and pass it on to them as a report or with a product like Unmetric, thanks to the extendable user base, you can help them access data on the dashboard by themselves. Instead of just looking at the numbers, your team will be investigating as to why the performance is so. Take customer service benchmarks for example. Though the average brand in the aviation industry takes over 3 hours to respond to queries, JetBlue has set the bar high with their ultra quick replies which come in an average of 30 minutes. After all, if you’re at the airport waiting to board a flight but have concerns, you do need them addressed ASAP. Good customer support keeps no one waiting. 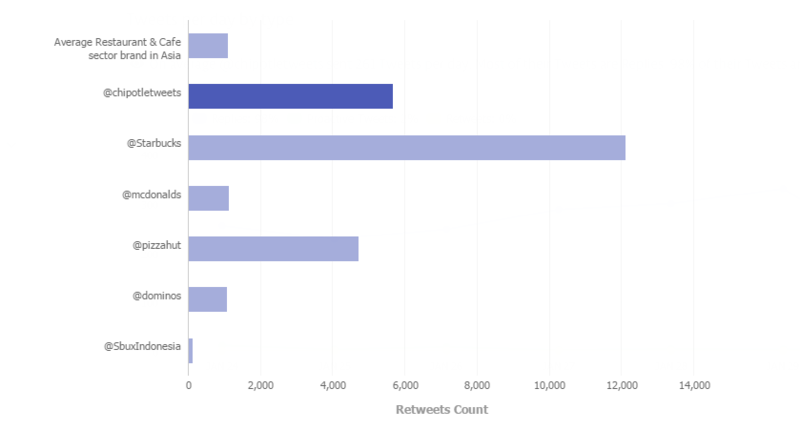 However, looking at response rate and mentions number, we see that KLM addresses far more @-mentions than JetBlue. Based on the industry benchmarks, a brand can inform its customer service team to optimize their reply time and response rate. What’s more, you can dig in and see the types of replies that generate more positive sentiment and, in turn, customer satisfaction. Similarly, content strategy, posting frequency and timings, and other facets of your brand’s integrated communication plan can be tweaked using benchmarks. To inject learnings from the benchmarks into their social media strategy and to initially find benchmarks for the key metrics, brands need a tool that flawlessly delivers these insightful numbers. When looking for a social media benchmarking tool, keep in mind that this will be your ultimate yardstick to measure your own performance and see how you stack up next to competition. The next feature to look for would be detailed customization where you can view the performance of your own brand according to a particular geography or industry. For instance, you might be a brand in the restaurant and cafe industry but find that peers in the food and beverage industry have a similar strategy against which you’d like to benchmark. The ideal tool is agile and lets the user tweak the benchmark guidelines as needed. Lastly, and most importantly, for teams that handle advanced analytics, the benchmark value should be customizable as an average or a median. Benchmarks across a variety of metrics. While social media benchmarks can give you a contextual overview of your performance, you need competitive intelligence to level up your social media strategy. To see for yourself how Unmetric can help you with both social media benchmarking and taking the leap with competitive intelligence, sign up for a free trial. If you are hard pressed for time, we can have someone from our team take you through a customized demo in 20 minutes or less. Go ahead and give Unmetric a test drive, your boss and clients will thank you later.